The industry-acclaimed infinity optics - the CFI60 system - successfully deliver long working distances and high NA and produce tack-sharp aberration-free images. They employ an eco-glass that is manufactured with no harmful substances such as lead and arsenic. 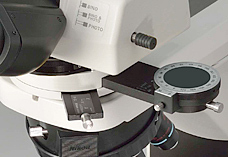 - Focus stroke has been improved to 30mm, facilitating observation of tall samples. 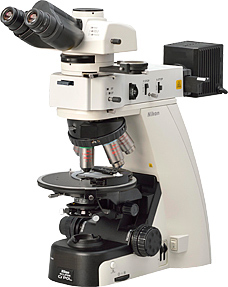 - Clamp-type upper limit focusing mechanism makes for easy and safe sample exchange. 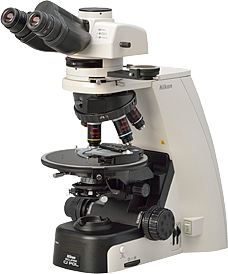 - Excellent cost effective and precision manufacturing is balanced with superb basic performance in a standard level polarizing microscope. 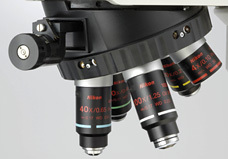 Both diascopic and episcopic polarizing observation are possible by mounting the LV-UEPI-N universal epi-illuminator. The epi-illuminator uses the high-intensity 50W lamp as standard which provides brighter illumination than a conventional 100W lamp. A noise-terminator mechanism is employed to provide sharp images with high S/N ratios.